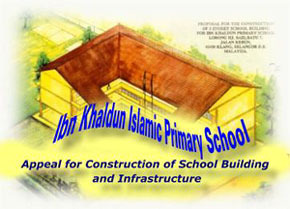 The Association of the Graduates of Malaysian Higher Learning Institutes (HALUAN) has initiated the setting up of a non-profitable community-based school, Ibn Khaldun Islamic Primary School, in 1990. We, having expertise in various field, have the intention to serve the community in the field of education. Ibn Khaldun Islamic Primary School has been established to cater for the need of an intergrated education system which combines the academic and Islamic religious curriculum. This school is curenntly registered with the Ministry of Education, Malaysia and the Selangor State Islamic Religious Department. Since its inception, the financial resources for the operation of the school has largely come from the student fees.The construction of school buildings/infrastructure/facilities has been entirely funded by donors contributions, consisting of our members and the general public. significantly increased in recent years. In order to cater for the projected increase of student intake, the School Board Committee is actively embarking on various plans to build new buildings so as to provide additional classrooms and other related facilities. The existing school classrooms are only sufficient to cater for 1998 school enrolment. The school is in dire need of adding more classrooms especially for 1999 school intake which starts in January 1999. For this purpose, the school is in the midst of building a 2 story school building with 8 classrooms. The cost of this building is RM240,000.00 or about US63,000 (US Dollars Sixty Three Thousands) (USD1.00=RM3.80). We are still short of fund to complete the construction of th is building. construct both the above school buildings. We hope InsyaAllah, with the successful construction of these buildings, we can further upgrade our contribution to serve the community by providing conducive and quality education environment which will ultimately translate to producing quality students. We pray to Allah Subhanahu waTa 'ala that Allah opens the heart of generous donors to kindly consider and commit their invaluable participation in the success of the school by sending us your donation. May Allah , through His Infinite Mercy, grant all of us the strength to endeavour with full sincerity in serving His Deen in order to gain His Pleasure.